That's what we call team spirit! Team USA basketball stars had the time of their lives cheering on America's swimming stars Tuesday. 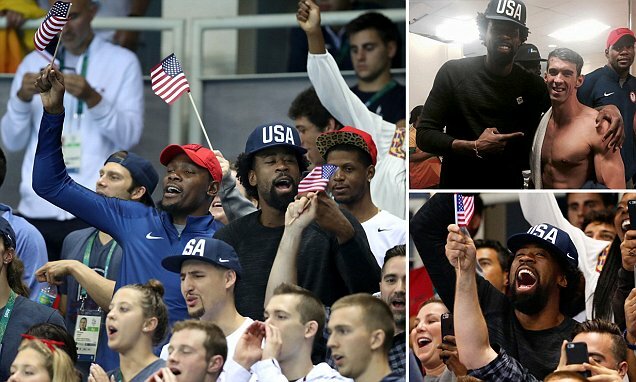 Pro ballers DeAndre Jordan, DeMarcus Cousins, Kevin Durant and Klay Thompson were all smiles at Rio's Olympic Aquatics Stadium — as they cheered on Michael Phelps, Katie Ledecky and the rest of US swimming. The basketball players posed for selfies after Katie Ledecky earned her second gold medal in Rio. They watched and cheered on Michael Phelps and Ryan Lochte as they took home yet another gold in the 4x200m freestyle relay. 'It's just a Maryland thing!!' gushed Kevin Durant on Instagram, posing with swimming sensation Katie Ledecky. The pro ballers have had an eventful time in Rio.